What did you get out of the day? How has the day contributed to educational activities that we do at the faculty? Would those attending recommend repeating it…and why? Wow! I can’t stop saying that – I learnt so much about myself and the lovely group I was with. This is where the greatest importance lies for me. We have hitherto worked with each other in different capacities in the Forum Theatre setting (as well as in others), but our focus has always been, I think, (at least for me) on our ‘part’ and what the students might get from the experience. Mark’s fantastic facilitation and expertise meant that I have come to realise how much better we can make that experience for students by really and genuinely relating to each other and by honing our performance. The dialogues and performances that each pair was able to produce after just one session with Mark was so much more powerful than any I had experienced in that way before. I have also noted the warm up exercises Mark used and I shall steal them un mercilessly for my own students. It was a shame we had to quit the room as promptly as we did as I felt that we could all have done with the opportunity to re-play our scenes, but the whole experience and Mark’s feedback was nonetheless an extremely useful and empowering experience. I would love it if our group could have a follow-up day to continue from where we got to as I felt we all could develop further still. Also I heard him mention a director’s day which made me wonder whether that, too, might be really helpful as we all, within the Forum Theatre sessions, take turns at facilitating it and my experience of Mark’s role in directing us, was that I would like to develop my skills of facilitation better as well. That way we could better ensure the students get the most learning from their experiences as well as possibly finding the format an even more pleasurable experience than they do already. We ask our students to take part in the ‘theatre’ in order to develop their skills as well as invite them to learn more. But I think, above all, we also challenge their attitudes and given the recent findings from the Francis Report and the need to focus on core nursing attributes such as our undergraduate curriculum professes (I’m thinking compassion towards patients and carers and courage and confidence to challenge bad practice). I think we could go further to do this. I for one, would be happy to be on a working party, should that be helpful – or to contribute to an article that may be we could all work together on. Whatever you think really as this is you academic area of expertise and the focus of your research and Mark was incredibly praiseworthy of your abilities. I can honestly say that this day has provided me with more valuable skills and techniques than any other self-development experience that I have had since leaving Higher Education. I was only really expecting to develop my acting techniques to enhance my contribution to forum theatre. I believe that it did achieve this, however the day did so much more in addition. This wholly self-affirming day was truly lifting and taught me so much about myself in relation to trust, and how much richer a teaching experience can be when colleagues know each other this well – the impact that this has on communication, education and morale was eye opening. I have learned about public speaking, projection from diaphragm and audience engagement. The bonding techniques and games are transferrable to student groups as well as for use when team working with colleagues. In a Faculty which places such importance on values based learning, it is important to have a variety of blended learning experiences – a lecture is not the most effective forum for delivering information on morals, ethics and values. Forum theatre delivered effectively can tap into a student’s emotion and really place them in an experience for full empathy. I feel that this day has given me a tool box of skills to enhance my pedagogic/andragogic resources. This day was physically and emotionally exhausting but has left me with such a profound legacy, and I am so grateful to have been given the opportunity to bond so closely with my colleagues. 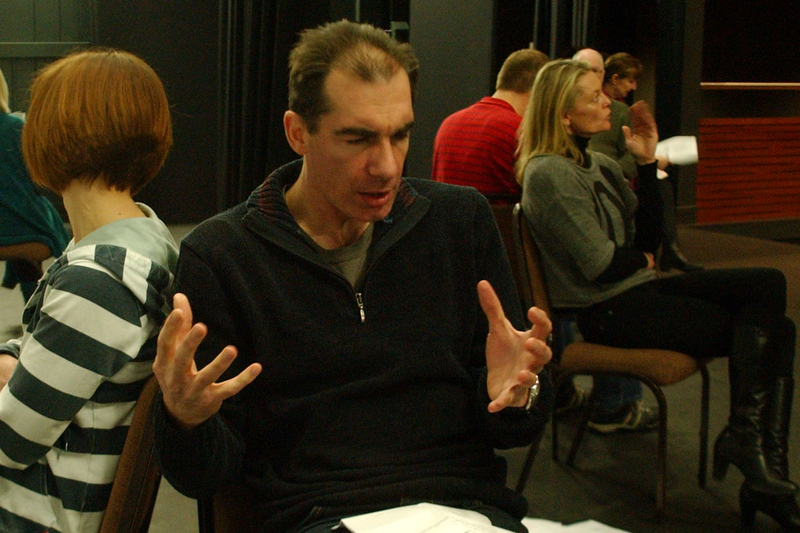 I would very much value a further day to build upon what we have learned so far; there are so many other commonalities between acting and lecturing and I feel that we have only just scratched the surface. I am very keen to attend the Directors programme that is also available – from the description this would be very beneficial for learning more about group facilitation. For me personally the day was very much about acting. I do not see myself as an actor and what I was hoping to get out of the day was how an actor might learn to read the audience, and how that knowledge might then be used to adapt what was being delivered to ensure everyone was engaged. On reflection after the day I realise that this was an unrealistic expectation as Mark comes from an acting background and I came with my lecturer hat on, and therefore an acting master class was not going to be able to achieve this for me. There was however an awful lot I took from the day and Mark was both an excellent facilitator, and also taught me a huge amount. I think for me the directors class may have been one which was more likely to meet my expectations, although I feel that if I had properly thought about what I was likely to get out of the day it would not have been what I was hoping. That being said it was a great day for both the fun we had with Mark and also the closeness of the forum theatre team. Many thanks again for the day and despite my comments above I would highly recommend the day as not only great fun but also as an incredible learning experience and confidence booster. Far more than I could have imagined. At an educational level; Witnessing exceptional skills of facilitation being role modelled. Inspirational teaching. Experiential learning at it’s best. Skills for connecting with large audiences. Appreciating the power and impact of alternative art forms as an adjunct to usual approaches to teaching. On another level, the value of working with creative and skilled colleagues under superb direction. How something like this can be immensely re energising for a fatigued workforce. A wonderful opportunity to discover through the excellent facilitation of a trained professional, the application of drama in teaching building on what we already do in forum theatre and role play. The day was about taking a risk and being prepared to be challenged though public performance in front of peers. It was about enhancing and honing skills in performance. It was also about affirmation of those things we already do well. The day had much safety built into it and it didn’t matter if we made mistakes, I didn’t feel pressured – the day was facilitated in order to build self-confidence into this. The day for me was a breath of fresh air, something to look forward to away from current work pressures, enjoyable, hard work and I feel I have learned much more about myself and colleagues. I feel my well-being has been enhanced through the experience. From a team-building point of view, it feels that I have cemented many new bonds with colleagues. What did you get out of the day? Practical skills in honing a performance, for example I had not appreciated before the importance of stillness when you are not delivering lines as it is so very distracting for the audience. There are many other examples that were learnt on the day, either by watching Mark’s skilful direction of a pair or in the process of being directed. I also witnessed and learnt from Mark’s exceptional facilitation skills, and although I would say I am able to facilitate well I think things I do will change for the better in light of watching and being on the receiving end of Mark’s careful and compassionate guidance. How has the day contributed to educational activities that we do at the faculty? Narrative pedagogy is well established in nursing, as is performative education. If we truly expect to be able to tell potential students that one of the ways we offer value for money is in innovative teaching then we must invest in it. This day helped me to be a better performer so that my contribution to performative education will have impact and meaning. Would those attending recommended repeating it…and why? I would recommend this day for those who have doubts about the power of performance for educational purposes, and for those who want to participate but are afraid of the stage. I would like to go on to the master class for directing. I am confident and competent in performance and participate frequently and willingly to this sort of education as an actor. However, it is likely that I will not always be the actor and will need to take the role of director when leading a day. To have guidance and support in directing colleagues who are acting would be greatly appreciated. Any other comments? As a team building exercise it was unlike anything I have ever done. At the end of the day the affection, compassion and care for my colleagues had grown and remains with me. The day was an overwhelming success on every level. The generosity of feedback has shown that those who attended really valued the experience. Following this event we are exploring the possibility of a ‘Masterclass in directing’ which Mark McGann also provides. WANT TO SURPRISE SOMEONE (OR TREAT YOURSELF!) WITH A FABULOUSLY UNIQUE, UNFORGETTABLE AND IMAGINATIVE GIFT THIS CHRISTMAS? – DRAMA DIRECT GIFT TOKENS AVAILABLE NOW!